West Windsor, N.J. – High-achieving graduates took center stage during Mercer County Community College (MCCC)’s Honors Convocation held at Kelsey Theatre prior to Commencement on May 19. Administrators and faculty members presented distinguished students with certificates and scholarships in recognition of academic excellence as proud family members looked on. 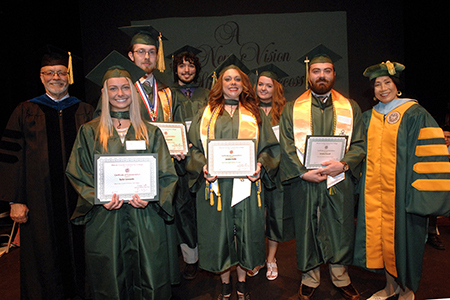 Among the 100-plus graduates were American Honors at Mercer, PTK and NJ STARS students. Dr. Jianping Wang welcomed students and guests in her first Honors Convocation address as college president, noting, “You are why we do what we do each and every day. I want to thank you for allowing us to be part of your journey to excellence.” She also took a moment to thank the family members who have played such a critical role in supporting student success. Presiding over the ceremony was Professor of Physics Jingrong Huang, the recipient of the 2015 Distinguished Teaching Award. Also participating in the ceremony were Ed Gwazda, Executive Director of the MCCC Foundation, Dr. Diane Campbell, Executive Dean of Student Affairs, and Dr. Richard Fulton, Interim Vice President for Academic Affairs. Numerous faculty members were on hand to participate in the presentation of awards. Graduates from all three divisions of the college – Liberal Arts, Business and Technology, and Math, Science and Health Professions – were called to the stage. Most of them completed their degrees while working full- or part-time. Many were returning adult students who have already earned bachelor’s degrees in other fields and/or are changing careers paths. A number of graduates are first generation college students. For some, English is their second language. A group of top scholars received multiple awards. Among them was Brittni Addye, who received the William Dowd Biology Award and the Excellence in Organic Chemistry Award. Addye, who served as president of the Organic Chemistry Club, will transfer to Rowan University as a pre-med student. Her long-term goal is to be a cardiologist. Her classmate, Barri Deptula, was the recipient of the Excellence in Chemistry Scholarship and an Abrams Foundation Scholarship. Deptula, who served as treasurer for the Organic Chemistry Club, will transfer to Rider University to major in Biology. She hopes to continue for her Ph.D., conduct research in the field of genetics, and teach at the college level. American Honors graduate Dean Blank was selected for several scholar athlete awards. A two-year member of the men’s basketball team, Blank, a Liberal Arts student, earned a 4.0 GPA and was the recipient of the Cynthia Schaffer Scholarship and the Forman and Sloshberg Memorial Scholarship. (The top female scholar athlete, basketball player Brianna Gurdon, was co-recipient of these scholarships.) Blank plans to transfer to study finance. His long-term goal is law school. Thirty-six graduates were recognized as members of the second cohort of the American Honors at Mercer program; they are the first group to have participated in the program for the two full years since it was introduced in Fall 2014. 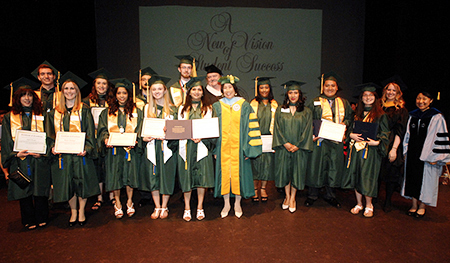 Among the numerous scholarship recipients were 11 graduates selected for Albert B. Kahn Scholarships. This thriving endowed scholarship program continues to support both continuing and graduating students. Edward Kahn Esq. and the Albert B. Kahn Foundation were honored at the 50th Anniversary Gala in April for decades of financial support to MCCC students. Also among the honorees were 19 members of Alpha Theta Gamma, MCCC's chapter of the Phi Theta Kappa (PTK) International Honor Society, including Radoslaw Dlugowski and Cody Willever, who were selected for the All-USA Community College Academic Team; 17 NJ STARS graduates, 10 new members of the Alpha Mu Gamma National Collegiate Foreign Language Society, and 34 students who were selected for Who’s Who Among Students. Five students who will transfer to William Paterson University (WPU) at Mercer in the fall were presented with WPU scholarships. 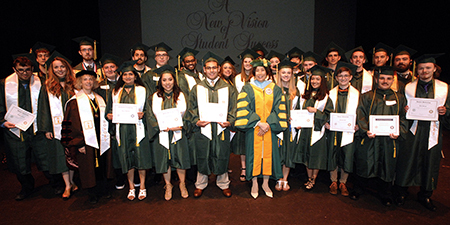 Nineteen PTK graduates -- those with a GPA of 3.5 or higher -- received special honors at the ceremony. 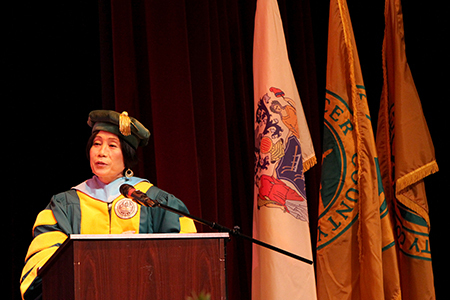 Presiding over the event was Dr. Jingrong Huang, who challenged students to continue to strive for excellence. 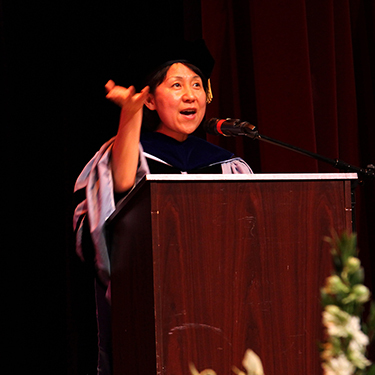 President Jianping Wang spoke at her first Honors Convocation. From left, Interim VP Richard Fulton, with Albert Kahn Foundation scholars Taylor Leonardo, Radoslaw Dlugowski, Richard Siggillino, Jennifer Vitella, Katie Mullen and Brendon Pearsall, and President Jianping Wang. From left, Dean of Liberal Arts Robin Schore, Liberal Arts grad Nnamdi Nnajiofor, President Jianping Wang and Interim Vice President Richard Fulton. 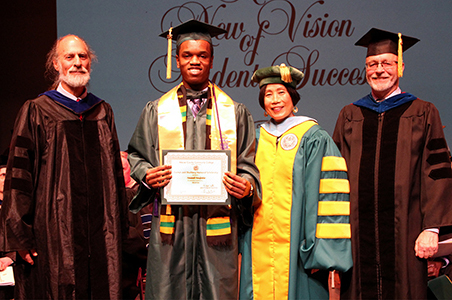 With a GPA of 3.9, Nnajiofor, whose mother, Rose, is also a member of the Class of 2016, earned a Forman and Sloshberg Memorial Scholarship, awarded for academic achievement. American Honors at Mercer grads numbered 36, the largest Honors class in the college's history. 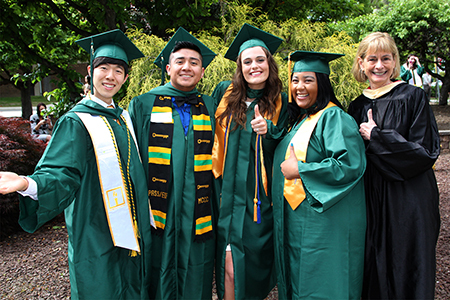 From left, Science and Math scholars Seon Gyu Lim (Cornelius Mathematics Excellence Scholarship), Kevin Ortega (Outstanding Volunteer Award in Chemistry), Barri Deptula (Excellence in Chemistry Scholarship), and Brittni Addye (Excellence in Organic Chemistry and Dowd Biology awards) with Professor of Chemistry Helen Tanzini.